It is unusual to find a book devoted to just one work of art. 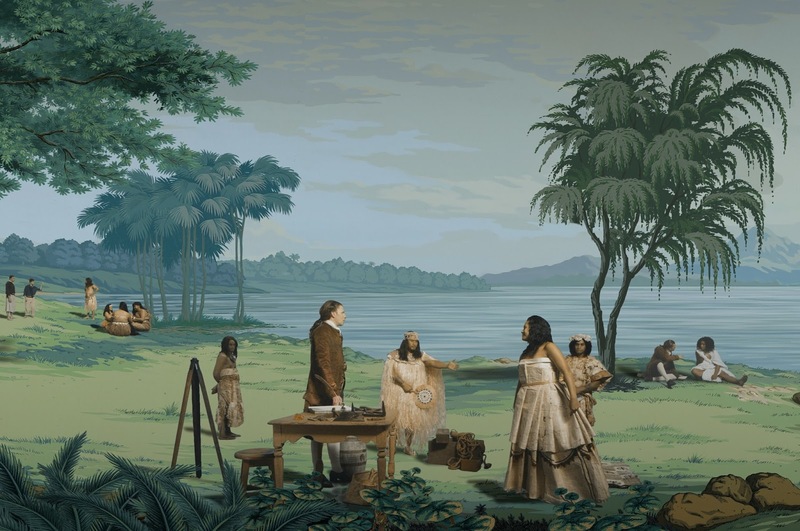 But Lisa Reihana’s in Pursuit of Venus [infected] is no ordinary work of art. Technically it is a “multi-channel HD digital video” lasting 32 minutes. It scrolls slowly from right to left in a continuous loop so there is no start or finish. The moving image is 26 metres wide and four metres high. It shows scenes of first contact between Polynesians and Europeans, Captain Cook’s observation of the Transit of Venus in Tahiti in June 1769, from a Polynesian point of view. For a much better description of it than I could do, see John Hurrell’s review at EyeContact. A reinterpretation of Les Sauvages de la Mer Pacifique, an 1805 panoramic “wallpaper” by Joseph Dufour which was a technological marvel in its day, Reihana’s video was a six-year project. Contributors include “performing arts students, film workers in costume and production, musicians, animators, technicians, and actors and dancers from Pasifika and Maori communities.” It is amazing, and the single best argument for state funding of the arts I have seen. So, to the book of the movie. It is amazing too. 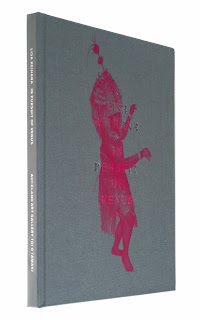 A 29cm by 23 cm hardback in full colour throughout, it is generously illustrated with stills from earlier Reihana works, production shots, the Dufour wallpaper, and even the entire 32-minute video as a long, long frame. There are 20 pages of stills, 12 full-page portraits of major characters, and a two-page list of cast and crew, more than 90 of them. It has been an intensely collaborative project, as the essays explain in absorbing detail. The book is a beautiful and technically outstanding production, with Philip Kelly’s design serving the project, rather than the other way around. There are many lovely details: the text is set in Vulpine, a typeface “based on the work of Pierre-Simon Fournier, an 18th-century punchcutter and typefounder”; the titles and borders were drawn by Kelly based on Fournier’s work so it is, in a way, another collaboration across the centuries. The product of “the latest materials and techniques”, Vivienne Webb’s essay tells us, Les Sauvages de la Mer Pacifique was printed on 20 “drops”, sheets of handmade paper glued together to form strips 2.5 metres high. When they were all joined together, the overall length was nearly 11 metres. “The manufacturing process was labour-intensive, involving hand painting, stencilling and woodblock printing, and by 1804, with the wallpaper in production, Dufour et Cie employed more than 90 people.” Hundreds of copies were sold in Europe and North America between 1805 and 1820. The essays that follow provide context for Reihana’s work in general and in Pursuit of Venus [infected] in particular. There is a pleasing minimum of artspeak – words like “trope” and “discourse” have been kept to a minimum. Here are some quotes. Deirdre Brown observes that this is “an unusual work for a Maori artist in that it deals directly with non-Maori Pacific cultures” and explains why a “Pacific identity can be a tricky one for a Maori artist to maintain”. As in everything she writes, Brown is illuminating and clear. Caroline Vercoe’s essay on the art practices and work of four other artists dealing with “founding colonial narratives” – Michel Tuffery, Greg Semu, Yuki Kihara and Rosanna Raymond – sets Reihana in a context I was aware of but didn’t know much about. I am now a little bit better educated..
Sean Mallon says frankly that “the images are likely to remain beyond the comprehension of most viewers. […] This is a reclamation that presents images so real that they appear to breathe, yet their secrets remain undisclosed, beyond reach.” I am sure this is true for most viewers but readers will be able to join the dots. A pleasing detail for writers: the title’s acronym POV is a pun on “point of view”, which the work is concerned with in several ways. One does not often encounter wit in contemporary art. There is much more information on the work itself at its website. The AAG has a useful page of links, including a good NZ Herald interview with Reihana. Superbly designed and produced, this is the most enlightening and absorbing book on New Zealand art I have read in years. It is a brilliant piece of publishing. Now that we have the NZ Book Awards restored, this has to be a major contender next year. And seriously, if you can, do go and see the installation at Auckland Art Gallery. I went up to Auckland last month just to see it, and am going again before it closes on 30 August. Don’t miss it.